L: 31" x W: 23" x H: 17"
Castin Microfiber Ottoman This Castin microfiber ottoman makes your job as a decorator as easy as ever! The plump cushion and oh-so-touchable microfiber make it a perfect footrest or comfortable extra seating. And with its neutral brown color, contrast topstitching and tufting detail, this ottoman also boasts a contemporary look that's versatile and stylish, too. This Castin microfiber ottoman makes your job as a decorator as easy as ever! The plump cushion and oh-so-touchable microfiber make it a perfect footrest or comfortable extra seating. And with its neutral brown color, contrast topstitching and tufting detail, this ottoman also boasts a contemporary look that's versatile and stylish, too. Knew we were going to get a sofa, chair and ottoman. We fell in love with the sofa and chair - firm and comfortable. The ottoman is a great size, works well with the chair and can be used with the couch or as an extra seat when guests come. Very happy and all three pieces look great in our living room. We purchased the love seat and the 3-piece seating in the Castin collection, when I got home to tell my husband, he said "what no Ottoman", I went on line, saw this piece, wrote down the code, emailed my salesperson Risa the next day, and so glad I did...perfect. We were given the ottoman as a gift from my mother in law. It is the perfect finishing touch to our sofa and loveseat combo. Its a perfect height, and is sturdy. Holds its shape perfectly and we couldn't be happier with this gift. It is a must have to go with any of the other matching set. Nice ottoman, perfect size, firm and sturdy. It is a comfortable place to rest my feet after a long, long day. Got the ottoman to go with the love seat. Smaller than some ottomans, but very firm and well made. Great fabric! This ottoman is exactly what we were looking for. It is comfortable to put your feet up on after a long day, but firm enough to support a tray of drinks and snacks for movie night. Love it and love Raymour and Flanigan. Nice addition to the chair. Made very well. Material is great especially with a cat. We recently bought this ottoman to go with our Castin couches. I cannot describe how much we love this furniture. It’s durable, easy to clean, and looks awesome in person! The ottoman is very sturdy, and is a great size. My husband and I often share it. We also have a cat that has scratched at the couches/ottoman once in a while and there are NO marks or tears. If you’re considering this line of furniture, you won’t be disappointed!! Perfect exactly matches clutch and adds that exact something that was missing. Bought this with the sofa and chair and have been very happy with it. Good quality, design and firmness. Perfect size as a foot rest with either the sofa or the chair, and can also be used as another seat if needed. Really happy we found this set. Bought 3 pieces and the ottomon and love everything. Flexible pieces to fit any space. [Associate name removed] from the Waterford store is awesome. He is knowledgeable and accommodating!! I bought the three pieces of couch, chair and ottoman. Very comfortable and looks great in my living room. 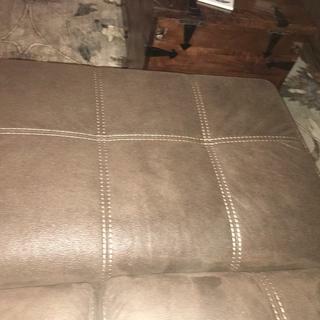 Purchased the 5 piece sectional AND the ottoman. So far, I love it! Looks great in my TV room and today I purchased another armless loveseat to extend it further in my room; the furniture didn't take up as much space as I expected! Appears to be nicely made and looks like it will hold up well. Quite strong and durable. Stays in place and works well with chair. BEST ANSWER: For up to date assistance with sales and promotions, please contact Online Sales at 866-383-4484, option 3. Does this item ever go on sale? I have two loveseats, love them! However, $350 seems alot for an ottoman. BEST ANSWER: We would be happy to discuss current promotions and pricing for the Castin Microfiber Ottoman over the phone. We can be reached at 1 (866)383-4484, option #3.